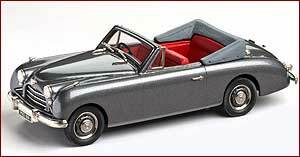 1954 Jensen Interceptor four seater convertible from the Lansdowne Models Collection, finished in metallic gray. 1937 Jensen 3½ Litre S Type. British styling combined with large American engines proved popular. Jensen was one of a number of small companies to use this formula along with Railton, Atalanta and Allard.The S Type usually used a Ford V8 of just over 3 and a half litres. 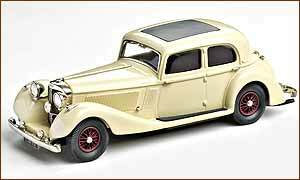 At around £700 it was not a cheap car, competing with the likes of Alvis, British Salmson, and the more overtly sporting Frazer-Nash. 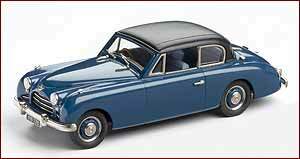 1950 Jensen Interceptor two door saloon, finished in two tone metallic blue and black by Lansdowne Models. 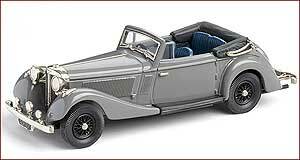 1937 Jensen 3.5 S Type Convertible from Lansdowne Models.